On a clear day, Mount Hood in Oregon, the giant dormant volcano about 75 miles to the east of Portland, is an inspiring pinnacle viewed from Oregon’s City of Roses. Of course a clear day in the Pacific Northwest coastal region, notorious for its rain and fog, is a blessed event. 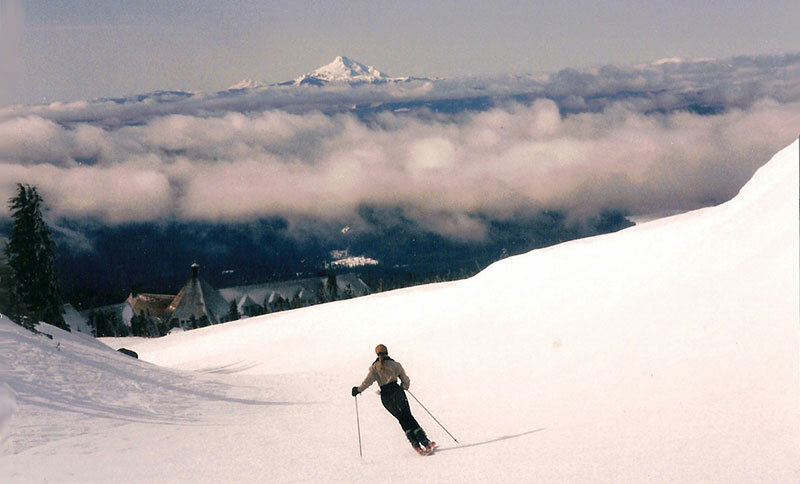 But on those treasured days, when the locals say, “the mountain is out”, Mount Hood extends an invitation to come up and play. In fact, Mt. Hood is a winter playground all year, boasting the sporty accolade as the only place in North America that offers summer skiing. This is home to the US Ski Team for their summer training camp. Mt. Hood is so big, at 11,240-feet, that it holds 5 separate glaciers surrounding its jagged peak and three major ski areas adorn its flanks. On our April visit to Oregon, we landed in overcast Portland and headed straight for the mountain. The 50-minute drive brought us from lush green urban development (indicative of the Mother Nature’s sprinkler system), to immense old growth pine trees. Finally, as we approached the Timberline Lodge at 6,000 feet, rain turned to snow. We arrived at the awe inspiring Timberline Lodge set high on Mt. Hood’s eastern side. Constructed under Roosevelt’s Works Progress Administration in 1937 to provide jobs, it was at the time an engineering marvel and is now a national treasure. This immense handcrafted wood lodge is spectacular in many ways. The 92-foot fireplace is the focal point of the hexagonal three-story lobby. Throughout the lodge are woodcarvings, wrought iron, mosaics and stained glass each unique to the rugged mountain environs and to the individual craftsmen of the project. The rooms are modestly furnished and authentic to the original furnishings right down to the appliquéd drapes and bedspreads. The view from our second story fireplace was of a huge snow bank. This elevation receives some 40-feet of snow each winter. By mid-winter the lodge’s ground-floor windows are covered and snowdrifts enclose the outdoor pool and hot tub like a snow cave. Dining at Timberline includes native dishes of venison elk and salmon complimented by wines from the Columbia and Williamette Rivers. Named for the Cascade Mountain range, the linen and candlelight dining room is south facing featuring a stunning view of 10,495-foot Mt. Jefferson in the distance. Timberline is Mt. Hood’s only on-slope lodging, the next nearest lodging is down the formidable 6-mile access road in Government Camp. Waking up at Timberline, we had no excuse but to be the first skiers on the Magic Mile high-speed quad to 7,016-feet. From here the Palmer Express quad climbs to the ski area’s highest elevation of 8,540-feet and awards skiers a whopping 3,590 vertical on over 1,000 acres. Unfortunately this lift was not opened during our day at Timberline, so we amused ourselves on the vast snowfield terrain under the Magic Mile. We had the place virtually to ourselves as we discovered fresh tracks in natural bowls. Dropping below tree line, we discovered some spectacular tree skiing. Lower mountain lifts include three doubles and a triple with plenty of intermediate trail networks for families to conquer. For on-mountain dining, there are several options within the immense Wy’east Day Lodge adjacent to the Timberline Lodge. Near the summit, the Silcox Hut (accessible only by lift or snow cat) is open for snacks on weekends, and is available as private cabin for all-inclusive overnight retreats for parties of 12-24 people. Ten minutes down Timberline’s Mountain Road and another ten minutes from the area known as Government Camp we discovered Mt. Hood Meadows, another giant ski area. This one sits on the northern flank of Mt. Hood. Meadows has a newer feel to it, starting with a glitzy new day lodge and four express quads. A quick lift from the base on the Mt. Hood Express quad gives a view of Five Bowls to the left and glades and narrower trails to the right. We ski past those offerings, heading for the Cascade Express and the highest lift serviced elevation (7,300-feet) on the Mountain. From here you can ski all 2,150 acres. Mt. Hood Meadows includes the absolutely huge “experts only” Heather Canyon. This immense backcountry section has more than 20 adrenaline chutes and bowls easily reached by an eastern traverse. If that is not enough, a SnowCat (offered on weekends) can get you another 1,020-feet of vertical dropping into the Canyon. The ascent out of the Canyon is a methodical double chair, but it serves as a welcome rest after the hair-raising steeps. From the Heather Canyon lift, there are half a dozen blue/black runs sharing planetary names under the Shooting Star Express. Mt. Hood Meadows is twice the size of Timberline’s skiing. But both areas offer remarkable terrain, making it worthwhile to “do the Hood” from different angles to appreciate the immensity of this volcanic peak. We did not make it to Skibowl, the smallest of Hood’s three ski areas. Mt. 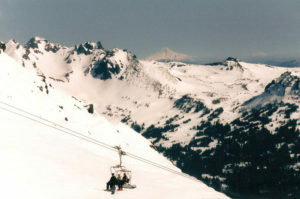 Hood Meadows closes end of May, while Timberline’s summit lift stays open through the summer. Mt. Hood is also legendary for summer hiking, but I prefer the high-speed quad approach.